Friendly and peace-loving Dragon-Cancer causes exceptionally positive emotions. He is always positive, loves people, sincerely rejoices at their success. This Cancer is not as vulnerable and sensitive as the rest of his brethren. An energetic dragon gives him strength and self-confidence. In turn, he receives from Cancer an invaluable gift of foresight. Dragon-Cancer is distinguished by a balanced character, does not commit rash acts. Extremely cautious and collected, and, if necessary, capable of giving a decisive rebuff. In addition, it can be stubborn, capricious and tactless. Therefore, do not over idealize the Cancer-Dragon, but you can not deny the attraction of his nature: this is an extremely charming man. Responsive Dragon-Cancer helps with great need all those who need it. Does not differ in arrogance and indifference, on the contrary, always close to the heart accepting other people’s problems. Has a unique ability to have people with him, so he is often approached for support and comfort. According to the combined horoscope, a man born under the sign of Cancer in the year of the Dragon, is distinguished by sincerity and kindness. For him, the desire to help is a natural need, and not an excuse to stand out and attract attention to yourself. Due to his intuition and ability to empathize, this person can become not just an adviser, but a real guardian angel. Dragon-Cancer likes to feel its need and necessity. Romantic, sensitive Dragon-Cancer is not able to be rude and behave defiantly. On the contrary, it tries to smooth out the contradictions, in any dispute pursues one goal — to settle the conflict peacefully. To bring him out of himself can be an exceptionally serious reason or a bad mood. Like any living person, Cancer-Dragon can not control its emotions. Can be touchy, suspicious and very stubborn. He reacts particularly sharply to criticism, does not tolerate remarks and ridicule over himself. It has enough strength and energy to be able to put the abuser in place. However, aggression from the Cancer-Dragon is a rarity. In general, this is a peace-loving person, tolerant of the shortcomings of other people. These people invariably draw attention to themselves, the nature of their magnetic attraction is quite understandable: softness and charm. Dragons-Cancers seem to radiate light: they have so much positive and sincere joy. They love communication, take great pleasure in their guests. They are distinguished by sincere generosity, a desire to make everyone happy. Try not to load people with their problems, prefer to solve all the issues themselves. Sometimes they are so immersed in dreams and fantasies that they do not notice anything around. In such cases, the dreaminess and romanticism of Cancer takes precedence over the activity of the Dragon. For them, the support of close people is especially important, otherwise they may be too far from reality. Emotional Cancer-Dragon is prone to strong experiences, because for him, love relationships are an important part of life. This temperamental man, blinded by a strong feeling, worships his partner. Produces the most favorable impression: attentive, caring and infinitely gentle. Resist his courtship is impossible, so he does not know the defeats on the love front. True, Dragon-Cancer will not hold back negative emotions if it encounters disrespect and disregard. On a love horoscope, Dragon-Cancer is a subtle, romantic nature. In dreams, he sees himself as a happy family man. Selflessly giving my warmth: too much desire to patronize everyone around. However, he still hopes for support and understanding. Looking for a reliable partner who can share all the hardships of life. Sometimes he is too fond of his fantasies, so he just needs a strong person nearby. Deeply devoted to the family, does not allow a shadow of doubt in the fortress of his marriage. Non-conflict, calm Dragon-Cancer knows how to smooth out working conflicts. Always ready for dialogue, perfectly controlling their emotions. Quite a little self-reacting to comments, does not try to prove his case. He does not hesitate to work for ordinary workers, but he will not be afraid to take the place of a leader. He tries to hide his doubts and worries, and his colleagues will show a radiant smile. This is a very responsible employee, who controls all his actions. For the Cancer-Dragon work is very important, but still inferior in importance to the family. If there is a need for a choice, there is no guarantee that he will not quit his job. He prefers occupations that guarantee a stable income and a calm environment. Can not fully work in an atmosphere of fear and tension. The creative profession and work in the social sphere are suitable for the Dragon-Cancer: a doctor, a teacher, a psychologist. It is perfectly capable of being an effective manager. The contradictory nature of the Cancer man, born in the year of the Dragon, manifests itself in each of his actions. He tries to think positively, but he has eternal doubts, hesitates before making any decision. This is a very kind person, sympathetic to someone else’s trouble, but at the same time very stubborn and sometimes harsh in his judgments. The Dragon-Cancer man is building very ambitious plans for life, the implementation of which depends on his courage and determination. Support and inspiration can be a family, he is attached to his loved ones. But a woman must accept his excessive emotionality, stubbornness and selfishness. Especially do not stop him from indulging in dreams, fantasies reassure the suspicious Cancer. 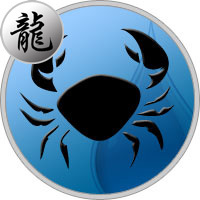 A Cancer female, born in the year of the Dragon, can be different, in her character the qualities inherent in representatives of both signs are guessed. This is a friendly person, open to communication. Most of all she wants to find the love of all life, but, having gained her happiness, begins to plague her with endless whims and unfounded pretensions. A smart, purposeful woman does not consider it necessary to restrain her emotions, although ill-considered behavior often causes her problems. Can achieve significant success in her career, but not very upset if you have to be content with a mediocre position. For her, the interests of the family are always in the first place, and she will sort out her own ambitions.